20 November 2018 (Toronto, ON) – Following a nearly five-year break from touring, Rush returned to the stage in 2002 to support the trio’s seventeenth studio album, Vapor Trails. During the tour, Geddy Lee, Alex Lifeson and Neil Peart played to some of the biggest crowds of the band’s career, including 40,000 people at the tour’s final stop in Rio de Janeiro. That concert was released in 2003 as RUSH IN RIO which was certified Gold in the U.S. and Canada. 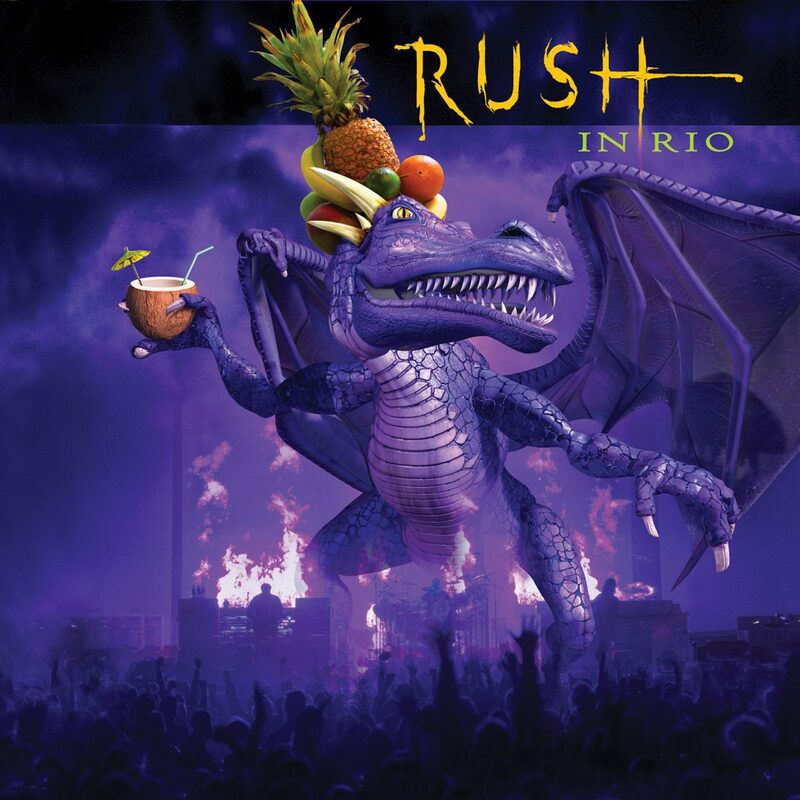 RUSH IN RIO was originally released on CD and DVD, but has never appeared on vinyl – until now. RUSH IN RIO will be available on January 18 as four 180-gram LPs. The set is presented in a heavyweight gatefold jacket and comes with a code that allows the music to be downloaded digitally, available from Rhino/ Universal Music Canada, the country’s leading music company. The collection includes all 29 songs the Rock and Roll Hall of Famers performed at the concert in Rio plus two bonus tracks that were recorded at other stops during the Vapor Trails Tour. “Between Sun & Moon” was recorded on September 27, 2002 in Phoenix, AZ and “Vital Signs” was recorded on October 19, 2002 in Québec City, Québec. Making the show in Rio rare and extraordinary, fan favourites that are rarely played together on the same night were peppered throughout the set list. This included the sprawling sci-fi epic “2112”, as well as “Closer To The Heart”, “YYZ” “Freewill”, “New World Man”, “Tom Sawyer”, and “Limelight”. One of the concert’s high points is Peart’s drum solo which is titled “O Baterista”- Portuguese for “the drummer”. That performance earned the group a Grammy Award ® nomination for the Best Rock Instrumental Performance. The songs that appear on RUSH IN RIO span the group’s entire career up to that point, including several tracks from Vapor Trails: “Earthshine”, “One Little Victory”, “Ghost Rider” and “Secret Touch”. The remainder of the set list touches on most of Rush’s studio albums including 1996’s Test For Echo (“Driven” and a rare acoustic performance of “Resist”); 1984’s Grace Under Pressure (“Distant Early Warning” and “Red Sector A”); 1980’s Permanent Waves (“The Spirit Of Radio” and “Natural Science”) and 1974’s self-titled debut (“Working Man”). Since forming in 1968, Rush has become one of the world’s most popular progressive rock bands. Between their debut album in 1974 and their final large-scale tour in 2015, the band has sold more than 40 million albums around the world, earning 24 Gold, 14 Platinum and three Multi-Platinum albums.